Cabling is the work cost most of the time when you do the CCTV System installation. fortunately, we can have some cables that can save some time and cost for us today. 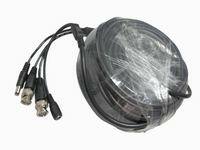 They are Plug Play CCTV Camera Cable and Bulk CCTV Siamese Cable. The Plug Play CCTV Camera Cable. The Plug Play CCTV Camera Cable, also called Premade CCTV Siamese Cables, which comes with the BNC connector, DC connectors or even with RCA Connector pre-terminated on the wires. The biggest advantage of using a Plug Play CCTV Camera cable is that there is no need for any tools or connectors. The work is already done for you! All the user needs to do is plug them in and power up your cameras. The disadvantage with using a Plug Play CCTV Camera cables is that these cables come at a certain length usually. ( Such as 25ft, 50ft, 75ft, 100ft, 150ft. ). It is not very flexible in use. And another thing you need to consider that is some suppliers does not use the real coaxial cable and heavy duty power cord for the Plug Play CCTV cable, since the connectors are pre-terminaled, the customers can't check the specification from the appearance of the cable, unless you cut it. These fake Plug Play CCTV cable can run in long distance. (Over 45ft). It will cause serious video degradation. Our Heavy Duty Plug Play Cable are made with 64 Braids shield Coaxial cable and heavy duty power cord, it can run in 200ft, and still have a great performance for the CCTV system. So you don't need to worry about the above fake problem with our cable. The Bulk CCTV Siamese Cable, also called RG59 With 18AWG( or 20AWG) Wire. Typically you can find spools of Bulk Siamese Cable at 500’ and 1000’ in the market. 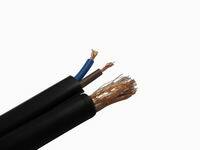 The advantage of using the Bulk CCTV siamese cable are flexible and cost. You can run the cable according to the distance when you install the system. And Most bulk CCTV siamese cables are more cheaper because the cost of building the cable is added. But if you buy bulk cable and build your own cables yourself you need to account for the added cost of a termination tool, wire stripper, BNC connectors, and your time. So the conclusion is that to choose the cable types that best support your CCTV system installation, you need to taking everything into consideration. The Plug Play CCTV camera cables may be perfect solution for some CCTV installations. The premade CCTV cables are easy to run and save you a considerable amount of time during installation. But it all depends on your application, your budget, your cable runs, and the time you want to spend to install your system.